The 2007 Office system is designed to increase individual impact, simplify collaboration, streamline business processes and content management, and improve business insight. Microsoft Learning can help you examine the new products by providing you, for a limited time, free training, e-learning, books, and skills assessments. Classroom training is also available for IT professionals and Home and Office workers. 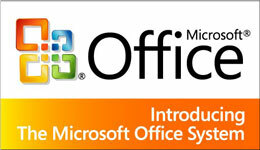 Simplify the challenges of today's workplace with the 2007 Microsoft Office system. Its enhanced intuitive design and improved features can help you get more out of the programs you use every day. With the training materials from Microsoft Learning, Office Workers can start taking advantage of the new functionality of Microsoft Office immediately.